Finally! New stuff is being added to my Etsy shop! And when I say “new” I mean jewelry I made a couple or more months ago and never properly photographed… It’s not that I don’t like doing it, but I don’t keep up with it. Then it results in LOTS of work to do all at once and it takes all the fun out of it. Of course that means the Etsy shop ends up being a dumpy old out of date jewelry page. I decided to order one of those “product photography” kits from Amazon. 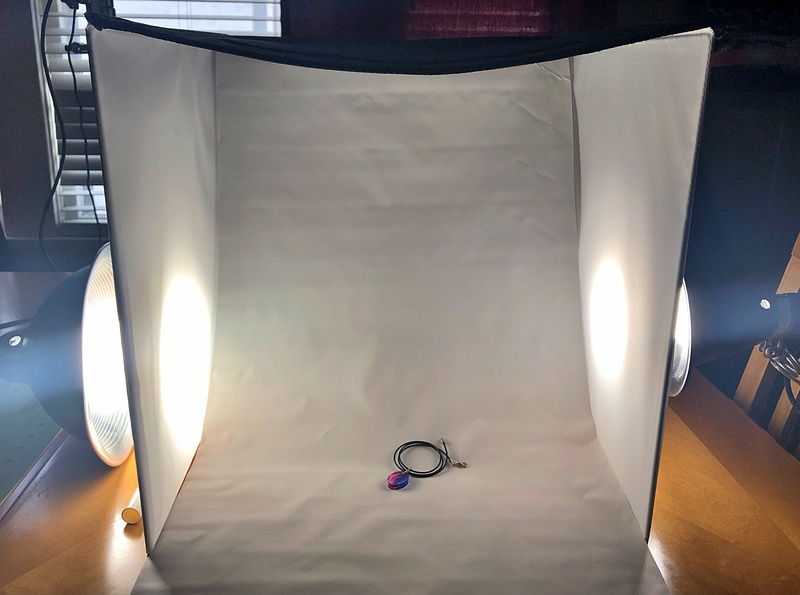 Not that buying something will magically update my Etsy shop for me, but I figured if I could take some really nice, somewhat professional-looking product photos that the ginormous backlog of jewelry to post wouldn’t seem so bad. In that respect, it’s working and I’m getting new items posted to the shop. Yay! But let’s talk about this kit that I bought. You’ll see them all over the place. It basically a soft box that you light from the outside. Many of them (like mine) fold up into a neat little square and come with backdrops, lights, and a camera stand. 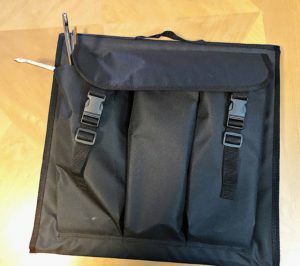 The one I got even has pouches in the front where you can store the extra gear. I didn’t want to get the cheapest of the cheap because I wanted something halfway decent, but I still went fairly cheap. I think I spent maybe $50? I ended up having to use my own lights. Well guess what – that was still too cheap! The box itself is okay, though it sags a bit on top. 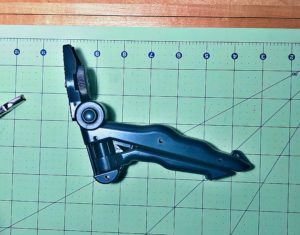 It’s quick and easy to set up and folds back very nicely. If I could do it again I would get just the soft box and I wouldn’t pay more than $15 for it. The rest of the kit was pretty much useless. The lights are these little ring lights that aren’t all that bad, but the stands they are on are beyond cheap. It would be okay if I could take the lights off and put them on something else, but the mounts aren’t universal and are the same cheap plastic as the stands. If this worked properly it would basically be a weapon. To open the base of the light stand you have to turn the end of it and these metal death spikes come shooting out. Then you splay them out and it’s a little tripod. One of the stands wouldn’t open and I’m pretty sure forcing it would break it (should I care about breaking it at this point?). The other stand won’t close back up. 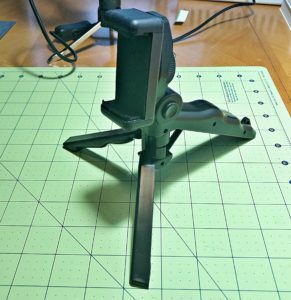 Then there’s phone/camera stand. 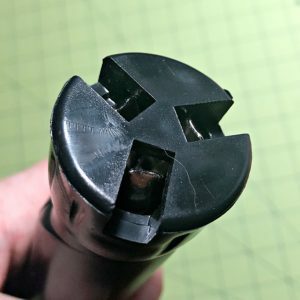 It’s some of the cheapest plastic I’ve ever seen and I couldn’t figure out how to open it at first. It looks like a garden hose attachment when it’s folded and two of the legs swing out to make it a tripod. I didn’t even try to use it. I’m afraid that if I throw this out at home my trash can will get mad at me. It’s that bad. I did end up getting some decent shots of my jewelry, but it took some editing afterward. The box didn’t light up very much, even with my own lights, so that had to be adjusted. Despite that, I had to do zero color correction and that alone is a win in my book! I’m not super happy about the wasted cash, but I am saving time editing because color correcting is a PITA. Pretty soon I’ll have nice uniform pics of my jewelry in my Etsy shop! I leave this by the door at night as a trap for intruders. All in all, one of these boxes is worth getting, but save your money and don’t get a kit. You’re just spending more for a bunch of junk. 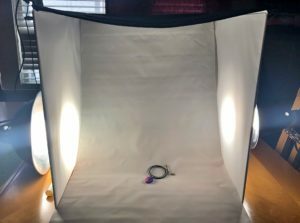 It’s cheaper to grab a couple of clamp lights and daylight bulbs, which are a great to have around anyway, and get a nicer box (or make your own). Thanks for reading! Please swing by my Etsy shop and check out the new listings. More is on the way! Until next time!